HF: IDJ’ s article The Oyster Beds of the Wang Cha area is a reminder of how much areas of Hong Kong have changed since it was written in 1961. I am very familiar with Yuen Long, Tin Shui Wai, Lau Fau Shan having been on numerous walks in this area since the early 1990s. 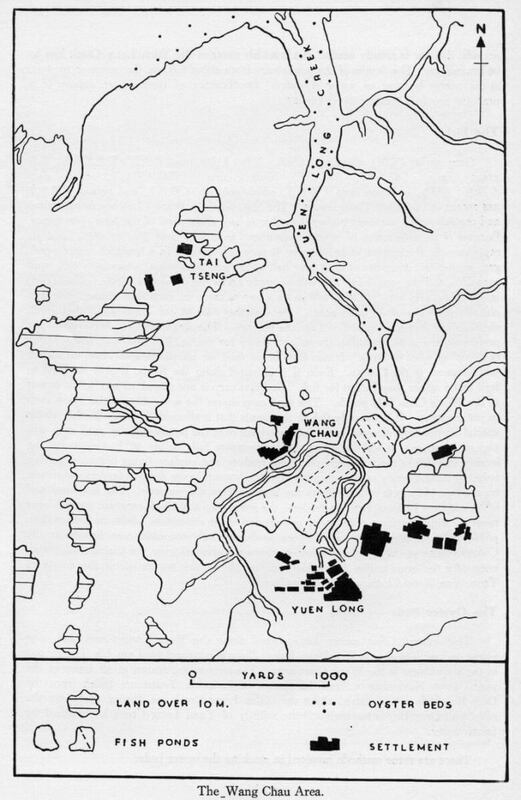 A comparison between the 1961 map from the above article and a comtemporary map shows for example how the river channels have altered. What is not evident from the maps is what has happened to the natural river channels of the early 1960s. The HK River Net group monitor rivers throughout HK. They cover drainage patterns, geology, land use, ecology and possible river restoration. Also the Impacts of Human Activities. Here’s what they have to say about the latter on the Shan Pui River, known in the 1960s as the Yuen Long Creek. This is obviously a very negative view of the flood control works in the Yuen Long area. I would welcome a positive response to the changes in the interest of maintaining a balance. Yuen Long Plain is in a low-lying area. In the past, the plain was often threatened by flooding. The government launched flood control works in Yuen Long in the 1960s. Nullahs were built in Yuen Long New Town and the area to the south. The river works straightened, deepened and widened the meandering channel, to increase water flow. In addition, the riverbed and riverbank were covered with concrete to reduce friction slowing water flow and for easy maintenance. A large section of the lower course of Shan Pui River was channelised and became a flood prevention channel. As Yuen Long underwent continuous development, the channel’s flood control capacity became saturated. In view of this, the government widened the channel from Chung Hau Tsuen to the estuary at Inner Deep Bay and created a new channel was created at Fung Lok Wai in 1990s. Channelization not only altered the river hydrology, but also affected the river ecology and aggregated the water pollution problems. Complete channelisation of downstream of Shan Pui River. To further reduce the risk of flooding in Yuen Long, a Yuen Long Bypass Floodway was constructed in 2006. The floodway intercepts 40% of the rainwater entering Shan Pui River basin, and channels it directly to the downstream section of Kam Tin River without passing through Yuen Long New Town. 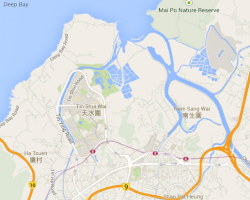 Yuen Long Bypass Floodway damaged 14.1 hectares of fishponds and farmlands. To compensate for the ecological loss, the government created an engineered wetland near the downstream section, to provide habitats for organisms that depend on wetlands. The organic pollution in lower Shan Pui River is serious. Massive amounts of domestic sewerage and livestock waste are discharged into Shan Pui River, as sewers are lacking in most villages and the numerous farms in the Yuen Long area. Furthermore, a major proportion of the farmland has been converted to storage places, workshops or garages, which discharge wastewater including grease and other chemicals into Shan Pui River. The altered land surface usually becomes impermeable. Rain or water from clean the facilities washes the pollutants into Shan Pui River across the impermeable land surface. In addition, commercial and industrial activities in Yuen Long New Town also pollutes the river, as there are illegal discharges from restaurants and garages. The wastewater contains grease, detergents, chemicals and food scraps, etc. Wastewater and rubbish follow the rising tide to enter Shan Pui River from Deep Bay and reach Yuen Long New Town, resulting in foul smells and urban blight. To solve the problems, the government built an inflatable dam near Tung Tau Wai, to intercept the Deep Bay backflows. When there are rainstorms, the dam is deflated to allow floodwater to flow out to the estuary. Inflatable dam at Tung Tau Wai prevents wastewater from the Deep Bay from entering Shan Pui River. Rivers are important sources of water for irrigation in rural areas. Wong Nai Tun Irrigation Reservoir, on the upper course of Shan Pui River, was built by the Water Services Department in 1961. The authority constructed a 2-km catchwater on the northwest side of the reservoir, to intercept river water from the southwestern upper catchment of Shan Pui River basin and channel the water to the reservoir for irrigation. The Shan Pui River tributaries below the catchwater dried up as a result of the interception. This not only reduced the water flow of Shan Pui River, but also destroyed the river ecology and hydrology.